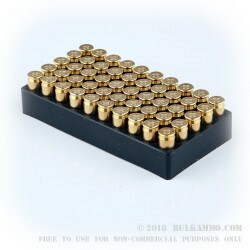 This is a 1000 round 45 auto bulk ammunition offering in a case lot that consists of 20 boxes of 50 cartridges each. The maker, Aguila is a company that was in part, started by Remington as a project in Mexico that could take advantage of the cheap labor and cheap materials costs that were prevalent in the 1960’s in the region. The company has since become a major producer of specialty rounds and rimfire cartridges that are super high production volume. 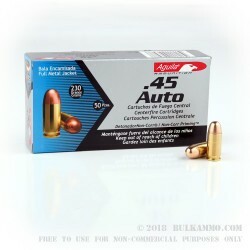 This is a .45 ACP load that is meant for training and target shooting and plinking purposes and offers a very good price point for the type of quality that Aguila is known for. A pretty straightforward load with the hardball profile, in 230 grains, a copper clad projectile with a large powder charge that approaches 850 feet per second velocity (830 fps actually in this load) and offers 352 ft. lbs. of energy at the muzzle. This is a quality option for those who want bulk shooting capabilities but don’t want to over pay for the ammunition. Aguila is a proven brand and the .45 ACP load performs admirably in all mainstream firearms chambered for the cartridge including a vast majority of the sub compact and compact framed firearms that have been released onto the market in the recent years. Q: Is this ammo remanufactured or factory new? A: Hello Brian, These 230gr. 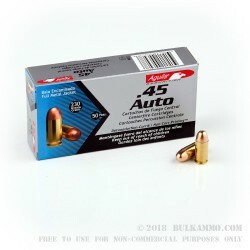 FMJ rounds by Aguila in .45 ACP are factory new and not reloads. 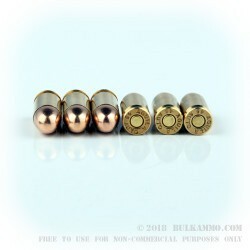 They will function great in any firearm chambered in .45 ACP.